I don’t usually mix mediums. As a clinical therapist I am compelled to approach clients and topics in a non-partisan way, without letting my personal biases affect what I am doing (as much as I am able). I don’t usually talk about religion or politics, and especially not religion. I am a person of faith, though not in the traditional evangelical sense, even though I never talk about it on forums like these. So because Lori Abercrombie is baiting me, (and knows damn well what I am doing in the other venture I am working on!) I will explain that project this one time. After this I will return to my regular, crass self. Alt is all about real and raw. We don’t edit life, pain or truth. We’re not interested in arguing about crap that doesn’t matter and we are welcoming of all people, regardless of background, issues, or sexuality. 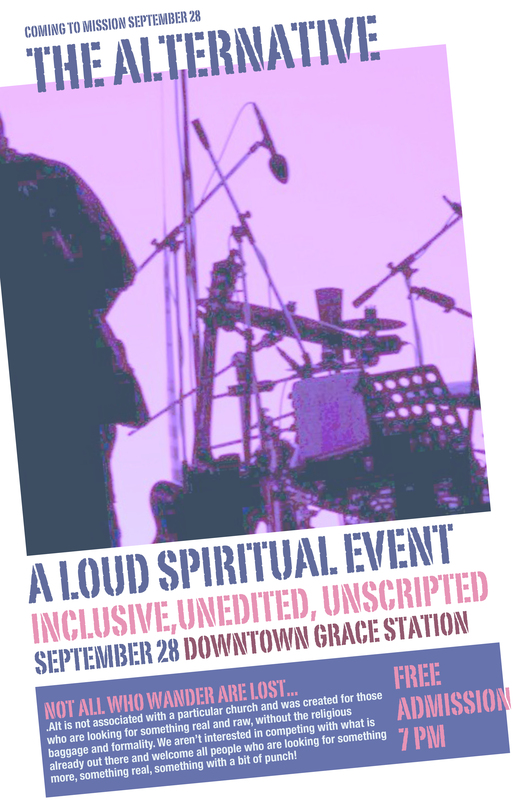 It isn’t a church, it’s an event – a chance to rock, a chance to heal, a chance to connect. We don’t care about rules, or denominations, or official boards or administration, that’s not our problem. If you are interested in hanging out, loud music, and meaningful connections with others and with God, maybe it’s time you joined the Alternative. The Alternative comes to Mission on September 28.
here’s the Facebook site: https://www.facebook.com/missionalternative. I am so in the wrong country for this … loud rock music really can be a spiritual experience in and of itself! I’m one of those not in the generation this would typically be marketed to, but I think it sounds great. (And your facebook page looks good!) All the best as you move forward. I’m curious. As a clinical psychologist, how does your faith effect your judgement or actions when speaking with a patient who is an atheist? My job is to help people move forward using whatever tools they elect to employ. It’s not my job to evangelize anyone. I wish you great success in your venture. It sounds tremendously appealing. I’ll be there!!! That is exactly what I’m looking for. So excited!! Now…one important question…. Where is Grace Station?? Thanks I know where that is. I’ll be there! Very cool idea ! Love the idea behind the event. (: best of luck with it , looking forward to the all knowing sage next time !